LG's SteamVR headset borrows heavily from the already excellent HTC Vive. That's not necessarily a bad thing when you consider all the positives plus its sharper resolution, but LG needs something (anything!) to set its virtual reality offering apart. Where will it fit in the VR ecosystem? How many virtual reality headsets does the world need? Apparently, if you're LG, there's room for one more. The venerable gadget maker has made a VR headset of its own. Designed for Valve's SteamVR platform, it's goes by the name of LG SteamVR headset, at least colloquially. This is prototype hardware, LG representatives were quick to point out before we fixed the headset to our craniums at GDC 2017. That means the device – from its looks to its specs – is subject to change before any official release. When that will be, by the way, is another question mark. For a prototype, the LG SteamVR headset is amazingly far along (how much will it really change, LG?). It feels like a well-developed device that, with a few refinements, a shiny coat of paint and maybe a little more glue, could make it out to consumers before long. Not just that; it could knock them off their feet. And while it's currently a highly capable piece of hardware that's comfortable to wear and boasts great graphics, the biggest hurdle facing LG's headset is the inevitable and justified comparison to HTC Vive. 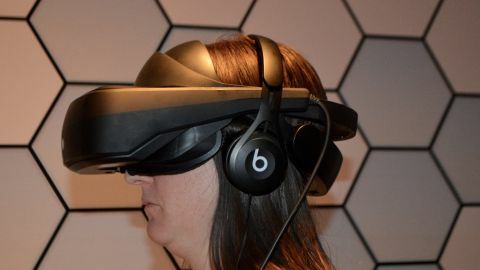 LG's headset is a near carbon copy of HTC's virtual reality headset in a number of critical ways. There are a few tweaks that help differentiate it, but when you have the headset over your eyes, it's hard to tell the difference. The similarities aren't surprising given LG's hardware is built to meet Valve's standards, and Valve and HTC have been VR bedfellows for a few years. The LG SteamVR headset taps into the same Lighthouse tracking system as the Vive, so when you're in a VR world, you have the exact same roomscale sensing technology backing you up. LG has introduced a few design elements of its own and made a slightly lighter headset, not to mention one with a much bigger visor. These adaptations prevent it from becoming simply an iteration of its older sibling. For one, the headset's visor is adjustable and flips up, which is actually a similar feature to the PlayStation VR. This lets you re-engage with the physical world without needing to take the headset off and put it back on again. It's an involved process to put the headset on in the first place, so this is convenient for whenever you need a breather. There are a series of steps to get the headset on that we had trouble performing, even after a run-through from an LG rep. Let's just say there's pulling, sliding, button pressing and cranking involved. The biggest cog in the set-up wheel is a dial in the back strap that lets you tighten the LG SteamVR around your head once you've got it in the right position. Owners of the newer HTC Vive are familiar with this dial mechanism already. This provides a snug fit, and though the headset slipped slightly as we used it, we found LG's SteamVR headset to generally feel comfortable and secure. Once the headset is up and running, you're welcomed to a world bursting with buttery smooth graphics, movements that mirror what you're doing in the real world (thanks to that tracking tech), and an overall delightful experience that pains you a bit to leave. Like the HTC Vive, you'll see the grid pattern that lets you know where a wall or object is when you come too close, a feature HTC calls its chaperone system. The headset's display resolution is 1440 x 1280 for each eye, making it sharper than the HTC Vive that resolves 1080 x 1200 per peeper. It also boasts a refresh rate of 90Hz with a 110-degree field of view, giving you a wide scope to look at in the visor and quick turns that aren't affected much by blur. Accompanying the headset are two controllers. Again, these borrow heavily from the HTC Vive's controllers, though the top of LG's design is a diamond shape rather than a circle. Reports suggest, however, that HTC is working on a similar look for its next-gen controllers. LG's controllers performed just as well as HTC's versions. In Racket: NX, an 'xtreme' ping pong game, we could follow a blazing ball around the room and whack it against a wall with the same finesse as if we were doing so in real life. Another game involved a bow and arrow. With an extended arm holding the bow, the other drew the virtual arrow back and shot it at (adorable) hostile invaders. The physics of the arrow's range and arc matched well with the angle we held the bow and how far back we cocked our shooting arm. The games were physically engaging and the whole system encouraged movement, whether to get meet the bouncing ball or reposition ourselves behind a castle turret for a better angle on an invader. The one trip up, literally, was the wire. LG's headset has the same leash to a PC as the HTC Vive and Oculus Rift, and we quickly became tangled. The common refrain is that the tether is needed to power graphics-intense experiences, and this is technically true. But after trying the growing suite of capable wireless head-mounted displays (HDM), it's getting a bit frustrating to go back to a lassoed system. We didn't get the sense LG intends to cut the cord, and that could be a knock against the headset if it's pitted against cheaper, wire-free HDMs at release. LG's SteamVR headset is almost great, which is saying a lot considering it's still a prototype. If this is early development, who knows how much better LG could make the device by the time it reaches consumers. It's a smallish thing when compared to stuff like superb graphics and tracking (two boxes LG's headset checks), but perhaps being able to lift the visor will be the one perk that attracts customers over the HTC Vive. Maybe it will be like the car sunroof of VR; you don't really need it, but if you have the option, why not go for it? LG still has a lot of work to do if it hopes to distinguish its SteamVR headset from the already excellent Vive. Right now, LG's version feels like not much more than the drawing board edition of a headset you can already buy. Maybe the similarity isn't a bad thing; the HTC Vive provides a wonderful experience, and if LG offers another take that taps into the same stellar tracking tech, and perhaps at a cheaper price point, then it could flourish in the VR space. What's more, Valve will have two lethal weapons against the Oculus Rift, which just introduced a significant price drop. Right now, however, there's almost nothing distinguishing LG's prototype from HTC's product. It is bursting with promise, but LG needs to actualize that promise into a headset that offers something (anything!) unique without going any higher, price wise, than the $800 HTC Vive. This is a tall order, but riding high off the celebrated LG G6 announcement and backed by proven VR tech, LG might just pull it off.